Study: pollution cooling summers in one part of China. September 30, 2012. Is the globe warming or is the climate changing? Policy makers and media outlets have long misunderstood the relationship between "global warming" and "climate change" as the terms are used in scientific literature, creating a false but popular dichotomy in which the planet cannot be warming if the climate is changing. Climate change, after all, must refer to both cooling and warming, but how can the planet be warming if both trends are happening at the same time? With popular confusion in mind, it is important for scholars of climate and its history to remind the public that, in scientific literature, climate change is the consequence of global warming. The world is getting hotter, but the warming influence of greenhouse gases, coupled with other pollutants, has set in motion a complex chain of atmospheric and oceanic changes that sometimes have surprising consequences. Some of those consequences are explored in a new study written by lead author Bian He for the journal Climatic Change. Over the past decade several studies have uncovered the existence of a pocket of summer climatic cooling within rapidly warming East Asia between 1951 and 2000. In the map above, blue icons refer to cooling in the study period, while red icons reflect warming. Bian and his co-authors feed additional instrumental data into atmospheric general circulation model simulations to uncover what is causing the doughnut-shaped cooling pattern. Increased regional aerosol pollution emerges as an important culprit, which is hardly surprising in light of another recent study that charted how similar pollutants delayed the onset of climatic warming in the most populated parts of Canada and the United States. What is surprising is the important role attributed to greenhouse gases. According to the authors, by stimulating global warming, greenhouse gases induce "enhanced water vapor in the warming air," and cause "more clouds over central and southern China." That, in turn, has strengthened the East Asian subtropical rain belt, contributing to regional cooling during the summer months. While this study has not received significant attention from most western news outlets, it provides a highly relevant peek into the sometimes counter intuitive complexity of modern climatic change. In the process, it elegantly illustrates how modern climate change - even when expressed in a temporary cooling trend - is a response, rather than an alternative, to global warming. Bian He et. 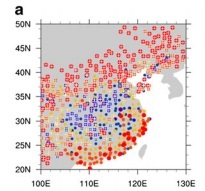 al., "Influences of external forcing changes on the summer cooling trend over East Asia." Climatic Change, 28 September 2012.